Whatever happened to the idea that programming in TSQL can be fun? A Simple-Talk reader contributes an article to remind us all that there is more to TSQL than wrestling with DMVs and pumelling recalcitrant correlated subqueries. Whatever happened to the idea that programming in TSQL can be fun? A Simple-Talk reader contributes an article to remind us all that there is more to TSQL than wrestling with DMVs and pummelling recalcitrant correlated subqueries. 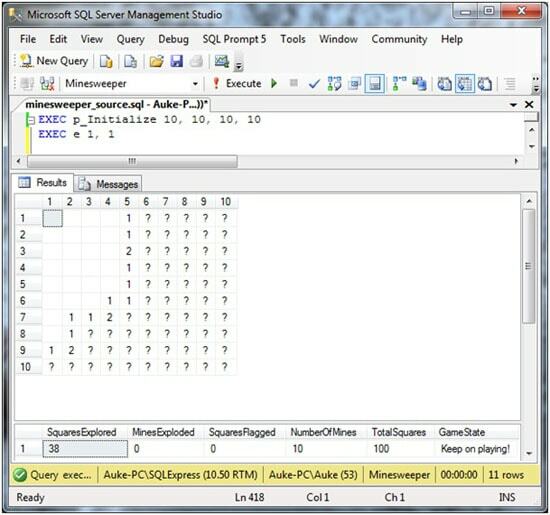 /* As a fun exercise I decided to program Minesweeper in T-SQL. I think it worked out quite nicely, so I’d like to share it with the world. But first, for anyone who doesn’t know what minesweeper is, a description is available here. I’ve used SQL Server Management Studio 2008 Express, but other versions should work as well (although the layout of the resultgrid might require some work). /* Although there are situations where the field can’t be cleared without guessing a lot can probably solved with procedures like p_Solve1. It might even be possible to have a procedure make an educated guess. Auke Teeninga decided about ten years ago to turn his hobby into his work and has been a software developer ever since. Other interests include salsa dancing, skiing, hiking and spending quality time with his girlfriend. Not a task I would have even thought of trying, but a very impressive bit of programming. Even if SOME think that T-SQL is not even a programming language. x down, y across….stupid mine. i wasn’t aiming there. I can’t believe you pulled this off in SQL! Auke, you’ve made my day. Can’t thought about a game in T-SQL. great work Auke.!!! That was pretty neat. T-SQL is a structured programming language, and despite the protests from the OO purists, people could get things done without OO. is to program lemmings in SQL. Pure Genius. Sir, you think so far outside of the box that it is as if the box ceases to exist. now for Star Trek, the original must have game from the 80’s mainframe sys progs! Very fun! It made me laugh while reading the article. Awesome! Good for nerd use, but bad in practice. I think it’s great when people can utilize a tool in creative ways, so this article definitely brought a smile to my face. Thanks, Auke! wonder if your boss realizes you are wasting compnay time/money creating this pointless crap. That is very cool. To all you people who think SQL isn’t a programming language, get over it. I didn’t have time to go through all the code, but did you guarantee that the player’s first explore never finds a mine? I would guess that you initially draw a grid of all “?” and then initialize it after the first explore. Hey, “waste of time”…my guess is his boss has the same clue as your boss know that you’re trolling tech forums. Works on SQL Server 2000 if you make these changes. Thank you for letting me play games inside SSMS. It is relatively boss-proof. One thing though: you draw the grid with X going down and Y across. I would have thought X should go across and Y down. From a programmatic standpoint, I’ve always used the traditional “IF” (or CASE) to handle the ending of logic. I thought this was a great way to handle the logic…deal with it at the beginning (with ISNULL of all things) and your problems are solved. As the Brits/Ausies say…”Brilliant”. With that kind of skill you’d have a lot of free time or with the time it took, you would have gained a lot of skill. Either way an employer wins and as well do we. Thanks for the mind opening ability of T-SQL. Here’s my entry for your competition. I am posting this in parts as your message size does not allow all of the code lines. Please let me know if you have any problems with it. Found out that I had left a bit of test code in my submission. It was in the ds_SolveMS procedure. Below is the same procedure as I had submitted, but it has the SELECT statement that was pre-setting the input values removed so now the parameters for the procedure will work. VERY cool. And to the haters – most of us who know T-SQL also know other languages (I am a C guy). We use T-SQL with our databases and C to create our database software. I challenge ANY of the haters to produce output like that displayed here via TSQL in your “real” programming language of choice. Bet we will not see ANY code.. Thanks everyone for your comments! Really enjoy the feedback! My boss was actually the first person I showed the article to. He was really proud of what I had accomplished in a few hours of my own spare time. Lemmings isn’t possible in T-SQL. Trademark issues 😉 Battleships, Tic-Tac-Toe, Connect Four, Mastermind and such games should be possible though. I didn’t add code to make sure you don’t hit a mine in the first square you explore. I don’t think it adds to the game, so I skipped it. Terry has posted the first enty to the competition, but keep them coming! Closing date competition September 30th. The closing date for the competition is September 30th. So send in your entries ASAP! —Instructions: There are two scripts of code required to play this two player (humans only) game. This first one sets up the game. –For the turn and the code will sort everthing else out. Have fun unconventionally ! One other note. Make sure to create a database called TicTacToe before running both queries. Fyi, I’m pretty new to programming and SQL so I’m sure there are better ways to do many things, but I’m doin what I can and trying to learn. Thanks! It won’t all fit, but combine parts 2 and 3 into one query for turn-taking. —For Turn Taking: Player X is first. Just type in the number of square to play your turn inside the Parenthases under “Here” and run query. Repeat for each turn. Enjoy! TicTacToe Game. Part 3 of 4.